It was a nice Sunday, weather-wise, and I wanted to go to a place that we had never been to before. Some place that wasn’t going to involve a long hike, but with some scenery that was worth checking out. The place at the top my list was Millstream Gardens Conservation Area. I have passed by it now and again, and I thought it was about time that we stopped there and saw what it had to offer. We were not disappointed! From south St. Louis County at the 55/270 interchange, take Interstate 55 south around 20 miles to Highway 67 south at exit 174B. Then stay on 67 south for about another 52 miles, to Highway 72 at Fredericktown, MO. Go right (west) on 72 for about 8 miles, and it will be on the left (south) side of the road. 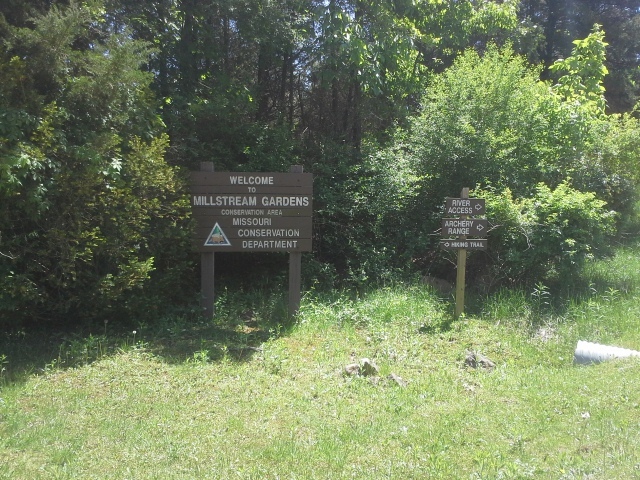 From the entrance at 72, take the road back until it forks at the Millstream Gardens Conservation Area sign. If you turn to the right, it will take you to the archery range and the access points to the St. Francis River. If you turn to the left, it takes you to the parking lot for the trail to the river and beyond. 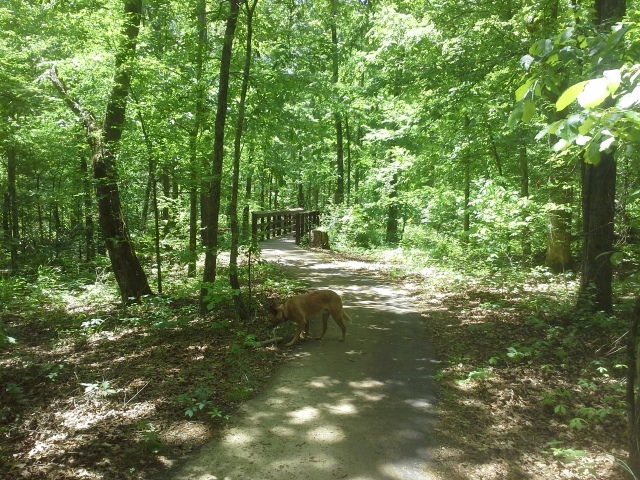 The mile long trail is a series of paved switchbacks, with a couple boardwalk watershed crossings, that takes you out to the observation deck and bluff area above the St. Francis River. Once you reach the river, the trail then turns and heads (unpaved) another mile and a half to the Turkey Creek Picnic Area, which is part of the Silver Mines Recreation Area. 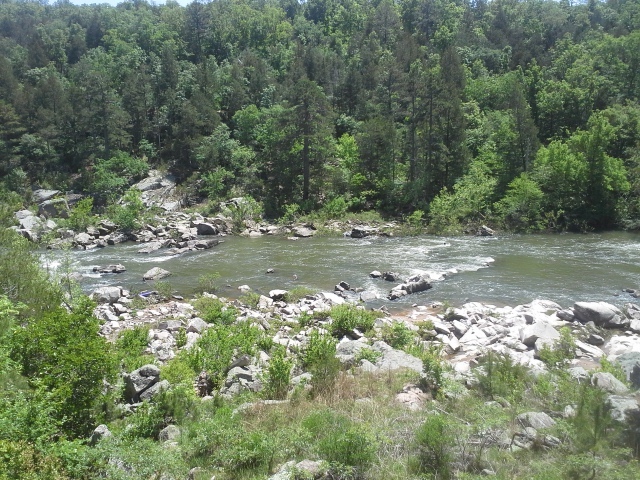 Once again, ANOTHER waterway near Fredericktown, MO that is just absolutely gorgeous. 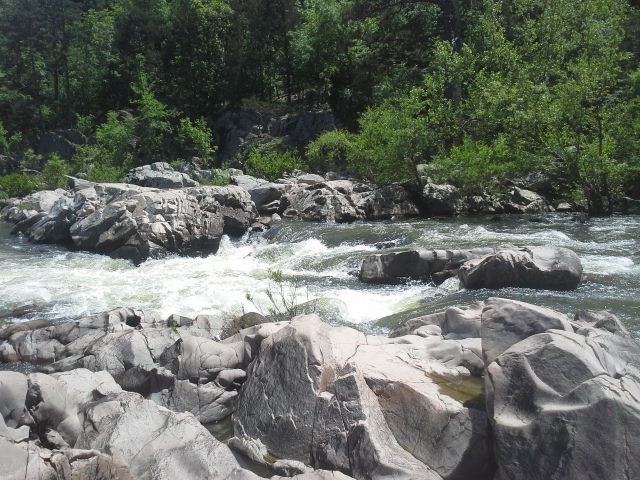 This section of the St. Francis River contains the Tiemann Shut-Ins, which is a striking collection of granite obstacles within the river, creating a series of rapids that would be a fun challenge for even the experienced kayaker. Along with all the rocks in the river, the boulders along the river bank are a lot of fun to climb and scramble around and over. It definitely stirred a desire I remember from being a kid, and Max and I spent a little bit of time exploring this natural playground. This is one of the few Americans with Disabilities Act trails that I have come across so far, and the level paved path to the observation deck would be quite an easy stroll for anybody. There were some shortcut trails between the switchbacks on the trail in, and along these shortcuts (and the trail itself) there was a good amount of noticeable Poison Ivy. Be warned, and stay on the path. I didn’t see any directly (just movement in the grass), but I would imagine that there are quite a few snakes in the area, especially among the boulder areas. Don’t go stickin’ your hand into places you can’t see into. 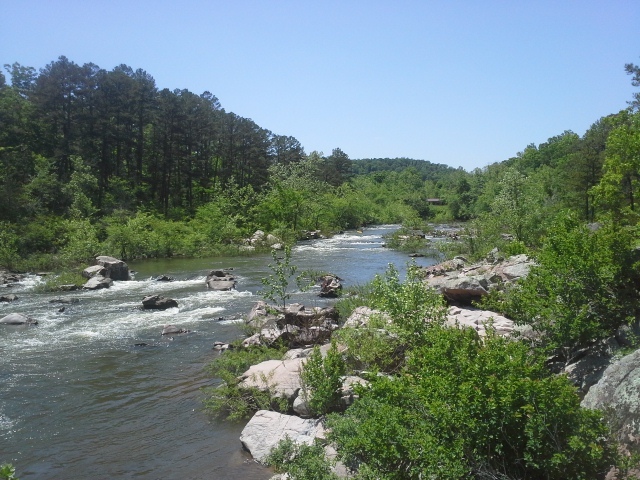 Every year they have the Missouri Whitewater Championships here because there are some challenging spots on this section of the St. Francis. Just from my riverside observation, I don’t know that I would be willing to take a canoe through it, and I think I would definitely find a different spot to take the family to if we were wanting to play IN the river. So there you have it…yet ANOTHER waterway near Fredericktown that is ridiculously scenic. I would start getting jealous if I didn’t feel so lucky to live within a couple hours of it. This really is a place that you have got to see. 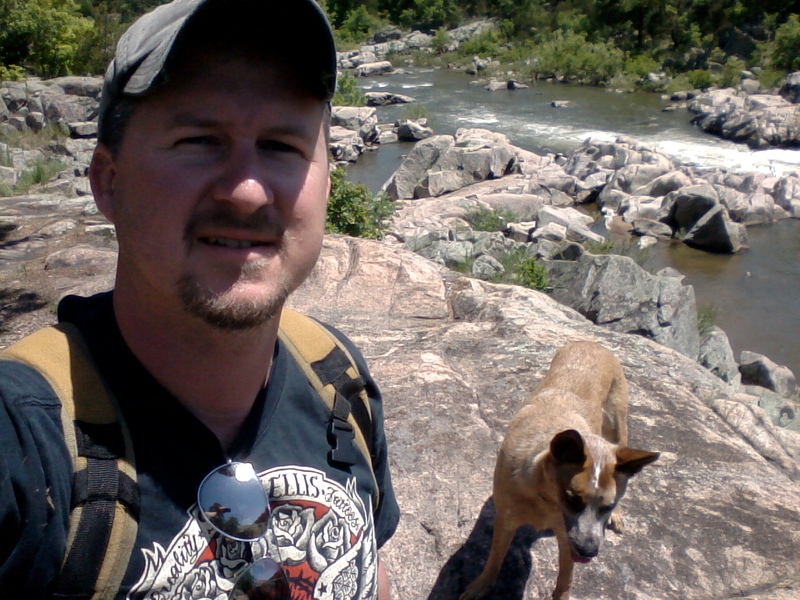 We were only there for a short time, and I am already devising a plan to go camping at Silver Mines so that I can spend more time climbing around on the boulders along the riverbank with Max, the adventure dog. Love the blog and enjoy the many scenic pictures you share. Missouri is filled with delightful places to visit! Thank you! 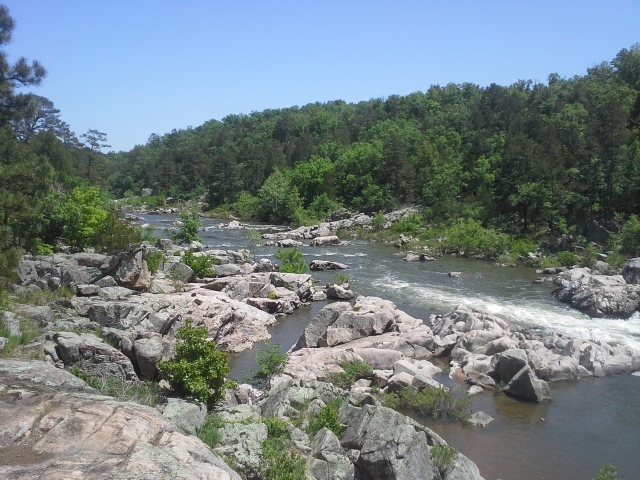 Missouri sure does have a lot of great places. I have been driving along 72 past this place for years, thinking “I should go see what’s in there…someday”. I had no idea it was so beautiful.